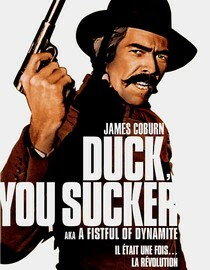 Featuring: Rod Steiger, James Coburn. Director: Sergio Leone. Look at that cover. Look at it. How could anyone not be intrigued by the possibilities? A cover like this one is only found on two kinds of movies. Awful movies, and awfully awesome movies. Luckily, this one is representative of the latter. I should have known that after I saw the king of spaghetti westerns, Sergio Leone, was at the helm. The first ten minutes of this film are strange, confronting and to be honest made me a little queasy - in a good way. The rest of the film is partly hilarious, a bit over the top, and disturbingly tragic. Needless to say there is a lot going on this film. It stars James Coburn as an IRA explosives-man on the run in Mexico during the revolution. Coburn's character meets up with a bandit, played by Rod Steiger, who is out to make the score of a lifetime and just happens to need a man that is good with dynamite. The two are rivals and confrontational at first but eventually build enough mutual respect to become friends. I won't really go into where the story goes from there, except that to say it goes all over the place and not in directions you will expect. This is one of those movies you find yourself enjoying way more than you thought you would. It's a roller coaster ride, filled with the ups and downs, the fear and all the excitement that goes with it. Check it out, you'll either love it or hate it. But, you're queue will look much cooler with that cover in it. Why is it in your queue? Look at that cover, seriously. What stood out the most to you? From the disturbing opening ten minutes I was hooked. What mood should I be in to watch this movie? Looking for something over the top, a little disturbed and different.